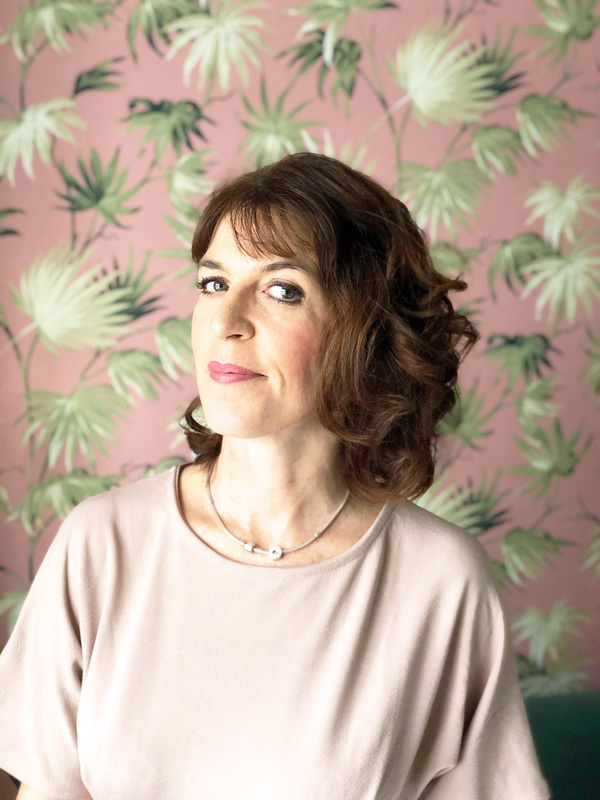 Have you ever thought I’ll just give the walls a lick of paint to refresh a living space to then have a snowball effect of wanting to change the whole look of the room? Errr…. well, that may have just happened to us. After nearly a year of convincing the I.E. 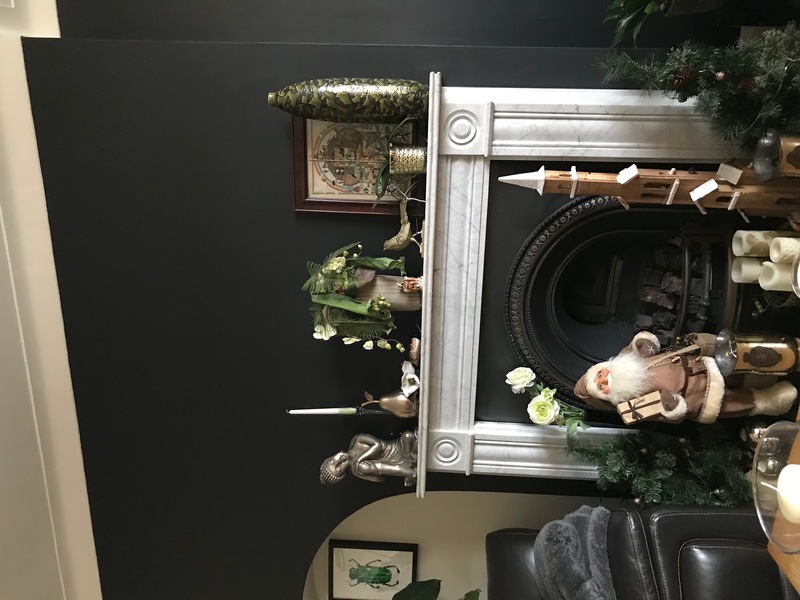 Hubs to step over to the dark side with our current interconnecting living rooms, he finally got his paint brush out and went for it with our fireplace walls!! I have to say that we absolutely love the transformation the nearly black walls have had on our living spaces. The problem now is our quick fix has turned into a full-blown need, or should I say want, to redesign! 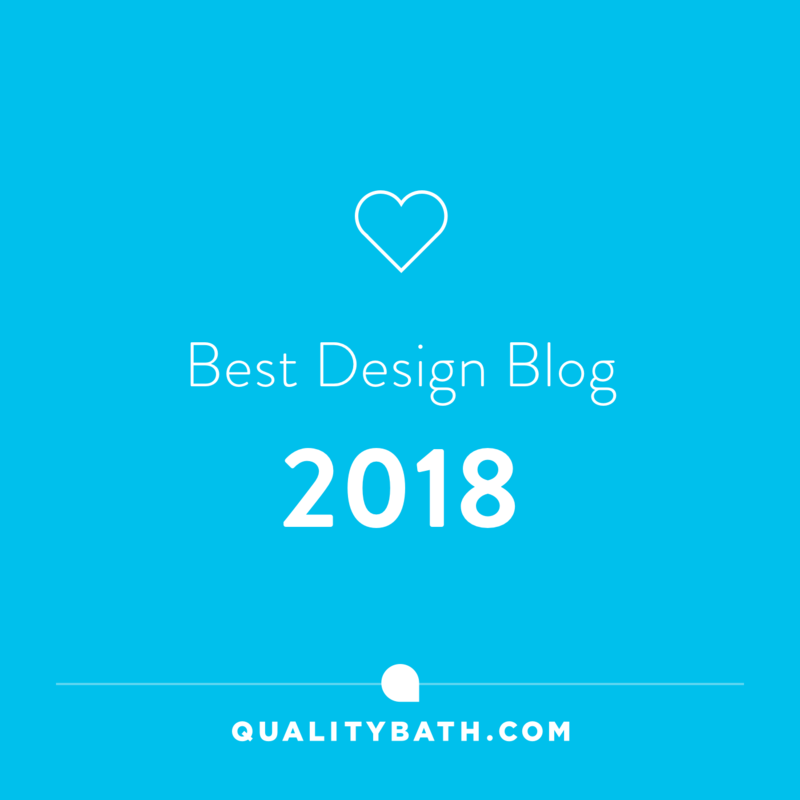 The reality is we should be concentrating on our poor old bedroom which is in dire need of a complete revamp so we are restraining ourselves not only because of costs but also because Christmas is only 17 days away……. yikes!! So we’ve agreed, for now, to only update the mirrors above our fireplaces and will come back to the once our bedroom has been completed early next year. 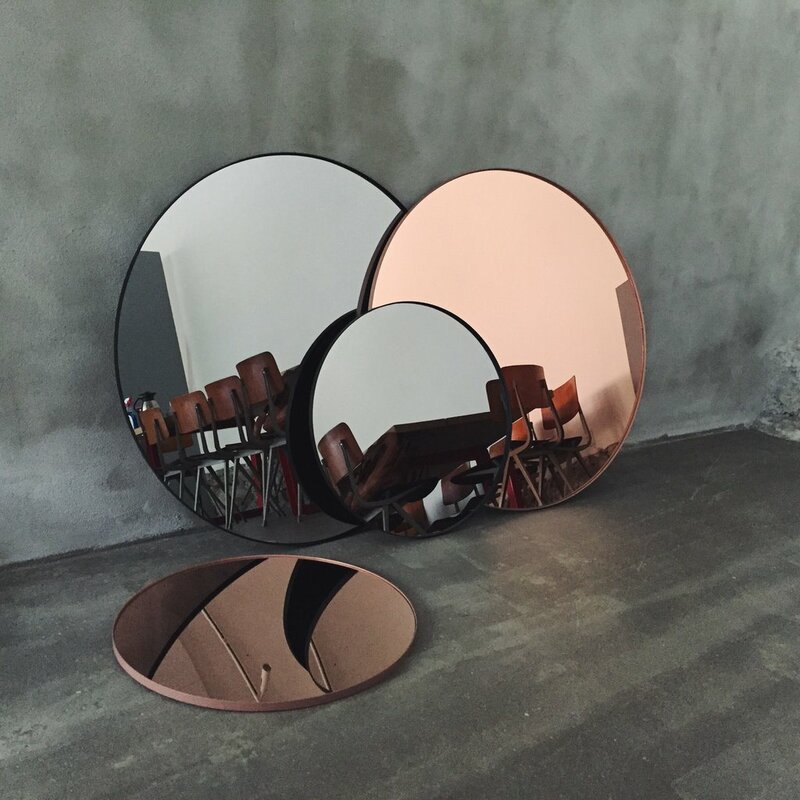 We wanted to go for something a bit different and have decided that circular mirrors may be the way forward for us. Today’s post is a result of my trying to find something that we can both agree on and, I have to say, that there’s so much choice it’s been a difficult task. 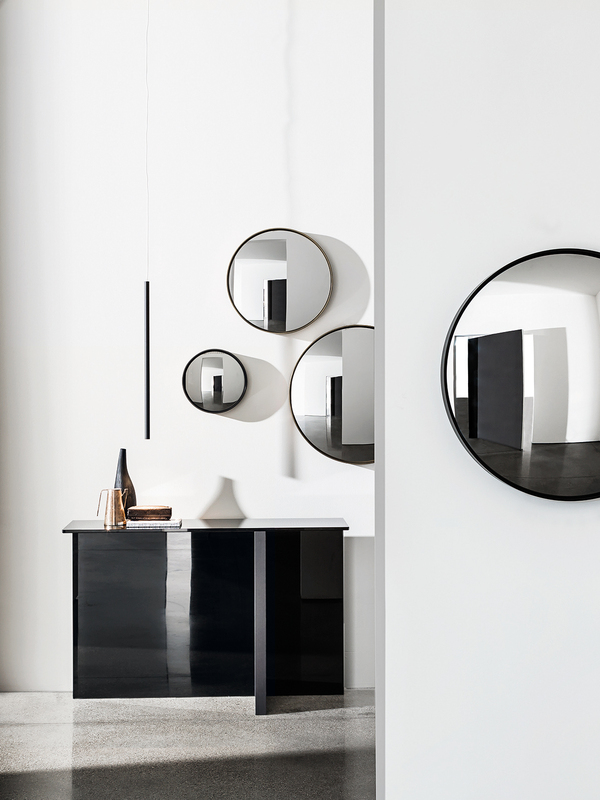 I’m kicking off with the timeless qualities of the Adnet Mirror available from Rume. Having originally been designed by Jacques Adnet in 1954 in collaboration with Hermes, it’s since been reissued using the original specification by Gubi in 2011. Inspired by equestrian tack, the mirror is encased in a heavy leather ring where you have a choice of tan or black and is hung from a strap with brass buckles. The length of which is in proportion to that of the mirror. Unfortunately, we don’t have the height with our ceilings, but you may have. I for one could look at this all day I just need a different house to put it in – (grins). It’s available in 3 sizes from 45cm to 70cm with prices starting at £559 which is definitely out of our range but again, may not be for you. Next up we have the Sail-Decorative Mirror available from Glass Domain. It’s a convex mirror which would provide a completely different look and perception of the room as it’s reflections appear distorted as you would with a fisheye lens. It’s certainly a mirror that would provide you with a talking point with friends and family and I kind of like the idea of having a different perspective of a room through an unusual mirrored reflection. What do you think? It comes in two finishes Mocha or a burnished brass and prices start from £240 for a 31cm, £400 for 52cm and £530 for the larger 68cm. I quite like the idea of combining the three sizes together too although I’ll be in trouble with the hubs for spending that much. We’re going a bit glam now with The Solstice Gold Mirror from Graham And Green It’s a mirror that exudes an effortlessly elegant look and feel to it. A decorative delight that’ll create an impact with its wave of intricate metal rays that connect to its outer circular form. Sophisticated but with a twist and looks great here on a neutral background but boy what an impact that gold would have on a darker toned wall like ours. It’s on the larger size at 93cm in height and width but it would mean we wouldn’t necessarily need to add anything else to the wall as this Solistic Mirror would do all the talking at creating a feature of one of our fireplace walls. It’s priced at £175 which, if you think about it, you’re getting a piece of art combined with a mirror so two for one. It’s definitely a contender! Available from Amara, the Circum Mirror by AYTM is definitely a mirror with a difference. Sleek and stylish in its form, the Circum is available in rose gold or smoked mirrored glass and is edged with a narrow wooden frame. 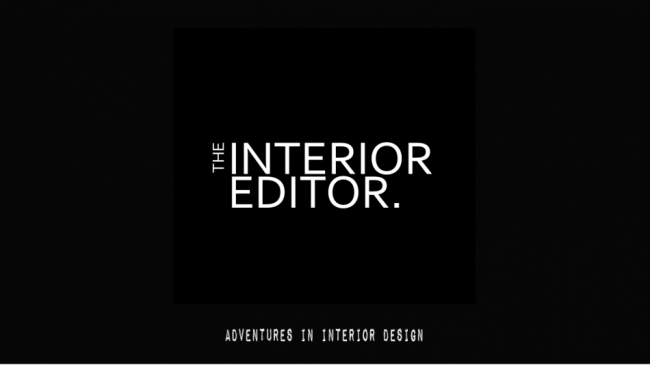 As we are yet to complete and decide on the overall look of both rooms, I think we’d have to opt and play it safe with the smoked black number. I personally love this smoked glass look and it would definitely add a bit of drama to a room. Price £155 – Dimensions: Ø70xD2cm. Oh, the simplicity of this mirror by The Forest & Co. has definitely got me swooning. Its gold metal border has a slight lip to it just enough to define itself against your wall. It’s also a good size not too small and not an overwhelming size at H50.5 x W50.5 x D4cm. For us, it would allow other artwork and decorative wallhangings to our fireplace wall. It’s also a complete and utter bargain and one of the cheapest circular mirrors I have found at this size. It’s reduced from £67.00 to £53.60 at the time or writing. 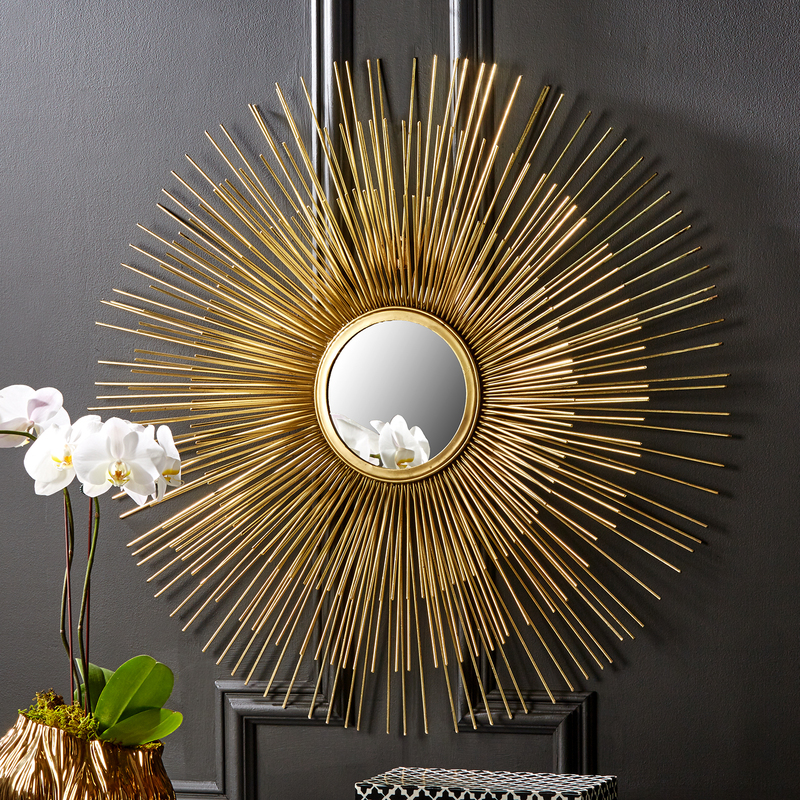 Definitely, a massive statement piece, this Sunburst Mirror by Audenza with its metallic gold finish is simply a stunner. Its decorative layers of gold rays radiating out from the small mirrored centre mean it’s more about the decorative than the reflection. Not so much of a problem when you hit your middle youth years and you start to avoid your reflection ;). It’s definitely a contender as I do love a bit of glitz and glamour and it would look superb on our dark walls as it does in the image above. If it doesn’t make it onto one of our fireplace walls, it may find it’s way into our bedroom!! Which one do you think we should go for? Decisions, decisions…….